This article applies to version 1 of Azure Data Factory, which is generally available. 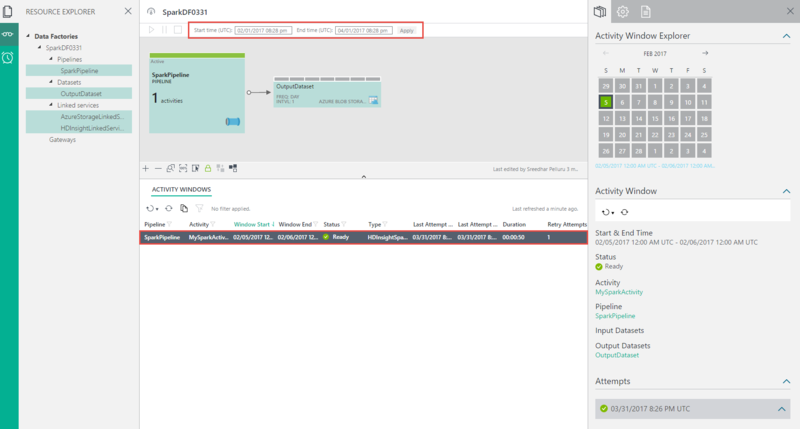 If you use the current version of the Data Factory service, see Transform data by using the Apache Spark activity in Data Factory. The Spark activity is one of the data transformation activities supported by Data Factory. 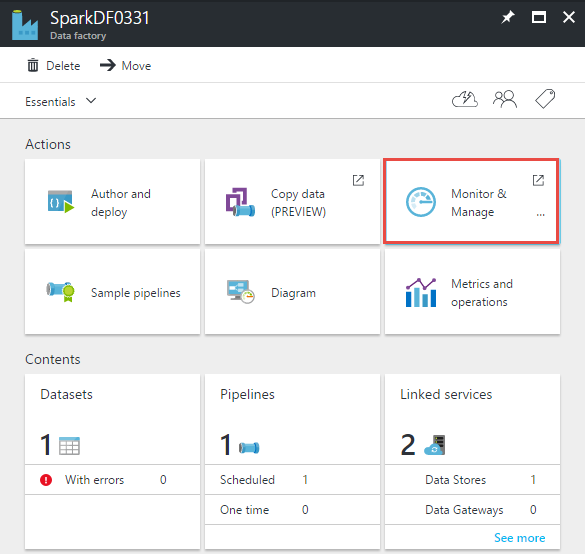 This activity runs the specified Spark program on your Spark cluster in Azure HDInsight. The Spark activity doesn't support HDInsight Spark clusters that use Azure Data Lake Store as primary storage. The Spark activity supports only existing (your own) HDInsight Spark clusters. It doesn't support an on-demand HDInsight linked service. Create an Azure Storage linked service to link your storage that is associated with your HDInsight Spark cluster to the data factory. Create an HDInsight linked service to link your Spark cluster in HDInsight to the data factory. Create a dataset that refers to the Storage linked service. Currently, you must specify an output dataset for an activity even if there is no output being produced. 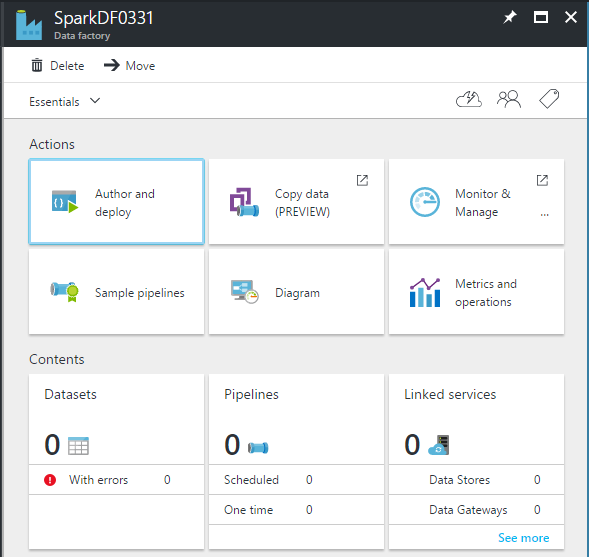 Create a pipeline with Spark activity that refers to the HDInsight linked service you created. The activity is configured with the dataset you created in the previous step as an output dataset. The output dataset is what drives the schedule (hourly, daily). Therefore, you must specify the output dataset even though the activity doesn't really produce an output. Create a general-purpose storage account by following the instructions in Create a storage account. 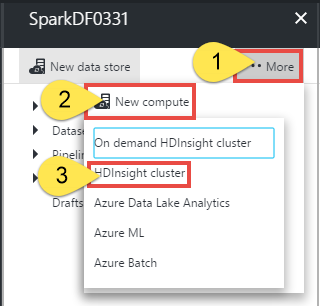 Create a Spark cluster in HDInsight by following the instructions in the tutorial Create a Spark cluster in HDInsight. Associate the storage account you created in step 1 with this cluster. Download and review the Python script file test.py located at https://adftutorialfiles.blob.core.windows.net/sparktutorial/test.py. Upload test.py to the pyFiles folder in the adfspark container in your blob storage. Create the container and the folder if they don't exist. Select New > Data + Analytics > Data Factory. On the New data factory blade, under Name, enter SparkDF. The name of the Azure data factory must be globally unique. If you see the error "Data factory name SparkDF is not available," change the name of the data factory. For example, use yournameSparkDFdate, and create the data factory again. For more information on naming rules, see Data Factory: Naming rules. Under Subscription, select the Azure subscription where you want the data factory to be created. Select an existing resource group, or create an Azure resource group. Select the Pin to dashboard check box. You see the data factory as it is created in the dashboard of the Azure portal. After the data factory is created, you see the Data factory page, which shows you the contents of the data factory. If you don't see the Data factory page, select the tile for your data factory on the dashboard. In this step, you create two linked services. One service links your Spark cluster to your data factory, and the other service links your storage to your data factory. In this step, you link your storage account to your data factory. A dataset you create in a step later in this walkthrough refers to this linked service. The HDInsight linked service that you define in the next step refers to this linked service too. On the Data factory blade, select Author and deploy. The Data Factory Editor appears. Select New data store, and choose Azure Storage. The JSON script you use to create a Storage linked service appears in the editor. Replace account name and account key with the name and access key of your storage account. To learn how to get your storage access key, see how to view, copy, and regenerate storage access keys in Manage your storage account. To deploy the linked service, select Deploy on the command bar. After the linked service is deployed successfully, the Draft-1 window disappears. You see AzureStorageLinkedService in the tree view on the left. In this step, you create an HDInsight linked service to link your HDInsight Spark cluster to the data factory. The HDInsight cluster is used to run the Spark program specified in the Spark activity of the pipeline in this sample. In the Data Factory Editor, select More > New compute > HDInsight cluster. a. Specify the URI for the HDInsight Spark cluster. For example: https://<sparkclustername>.azurehdinsight.net/. b. Specify the name of the user who has access to the Spark cluster. c. Specify the password for the user. d. Specify the Storage linked service that is associated with the HDInsight Spark cluster. In this example, it's AzureStorageLinkedService. For more information about the HDInsight linked service, see HDInsight linked service. To deploy the linked service, select Deploy on the command bar. The output dataset is what drives the schedule (hourly, daily). Therefore, you must specify an output dataset for the Spark activity in the pipeline even though the activity doesn't produce any output. Specifying an input dataset for the activity is optional. 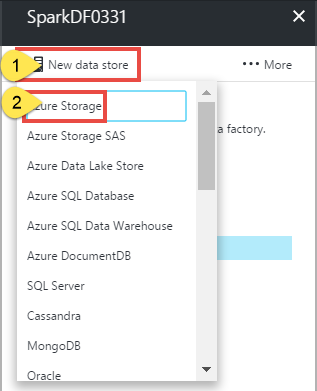 In the Data Factory Editor, select More > New dataset > Azure Blob storage. Copy and paste the following snippet to the Draft-1 window. The JSON snippet defines a dataset called OutputDataset. In addition, you specify that the results are stored in the blob container called adfspark and the folder called pyFiles/output. As mentioned previously, this dataset is a dummy dataset. The Spark program in this example doesn't produce any output. The availability section specifies that the output dataset is produced daily. To deploy the dataset, select Deploy on the command bar. In this step, you create a pipeline with an HDInsightSpark activity. Currently, the output dataset is what drives the schedule, so you must create an output dataset even if the activity doesn't produce any output. If the activity doesn't take any input, you can skip creating the input dataset. Therefore, no input dataset is specified in this example. In the Data Factory Editor, select More > New pipeline. a. The type property is set to HDInsightSpark. b. The rootPath property is set to adfspark\pyFiles where adfspark is the blob container and pyFiles is file folder in that container. In this example, the blob storage is the one that is associated with the Spark cluster. You can upload the file to a different storage account. If you do so, create a Storage linked service to link that storage account to the data factory. Then, specify the name of the linked service as a value for the sparkJobLinkedService property. For more information about this property and other properties supported by the Spark activity, see Spark activity properties. c. The entryFilePath property is set to test.py, which is the Python file. d. The getDebugInfo property is set to Always, which means the log files are always generated (success or failure). We recommend that you do not set this property to Always in a production environment unless you're troubleshooting an issue. 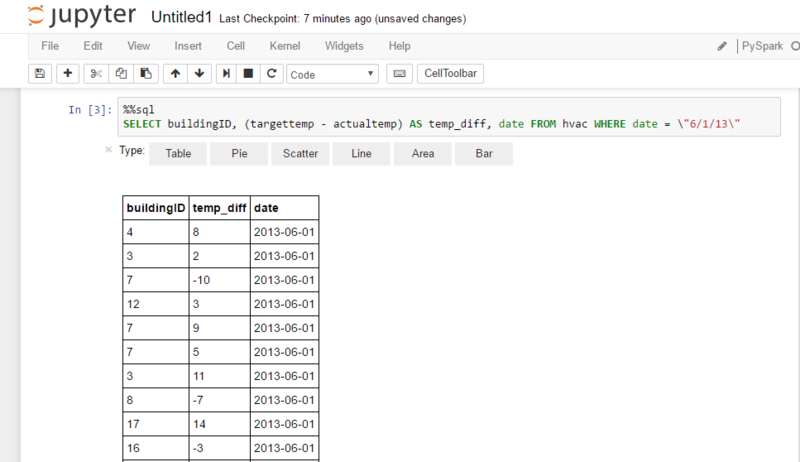 e. The outputs section has one output dataset. You must specify an output dataset even if the Spark program doesn't produce any output. The output dataset drives the schedule for the pipeline (hourly, daily). For more information about the properties supported by the Spark activity, see the section Spark activity properties. To deploy the pipeline, select Deploy on the command bar. On the Data factory blade, select Monitor & Manage to start the monitoring application in another tab. Change the Start time filter at the top to 2/1/2017, and select Apply. Only one activity window appears because there is only one day between the start (2017-02-01) and end times (2017-02-02) of the pipeline. Confirm that the data slice is in the Ready state. In the Activity windows list, select an activity run to see details about it. If there is an error, you see details about it in the right pane. Start the Jupyter Notebook for your HDInsight Spark cluster by going to this website. You also can open a cluster dashboard for your HDInsight Spark cluster, and then start the Jupyter Notebook. Select New > PySpark to start a new notebook. Confirm that you see the data from the hvac table. For detailed instructions, see the section Run a Spark SQL query. Because you set getDebugInfo to Always, you see a log subfolder in the pyFiles folder in your blob container. The log file in the log folder provides additional information. This log file is especially useful when there is an error. In a production environment, you might want to set it to Failure. Select Logs for one of the run attempts. The following sections provide information about the data factory entities to use Spark cluster and Spark activity in your data factory. The following table describes the JSON properties used in the JSON definition. The Spark activity doesn't support an inline script as Pig and Hive activities do. Spark jobs are also more extensible than Pig/Hive jobs. For Spark jobs, you can provide multiple dependencies such as jar packages (placed in the java CLASSPATH), Python files (placed on the PYTHONPATH), and any other files.